Growing up my mother made a cabbage salad all the time, but it was always dressed with oil and vinegar, never with mayonnaise. I had tried store bought coleslaw, but I always found them too sweet. This one with the addition of vinegar, I found perfect. I made this as I was making pulled pork burgers and I could not imagine eating a burger without something fresh or crunchy in it, for me, it had to have coleslaw in it. It was a perfect combination. Double or triple the recipe. Make as much as you need. Keeps in the refrigerator for days. 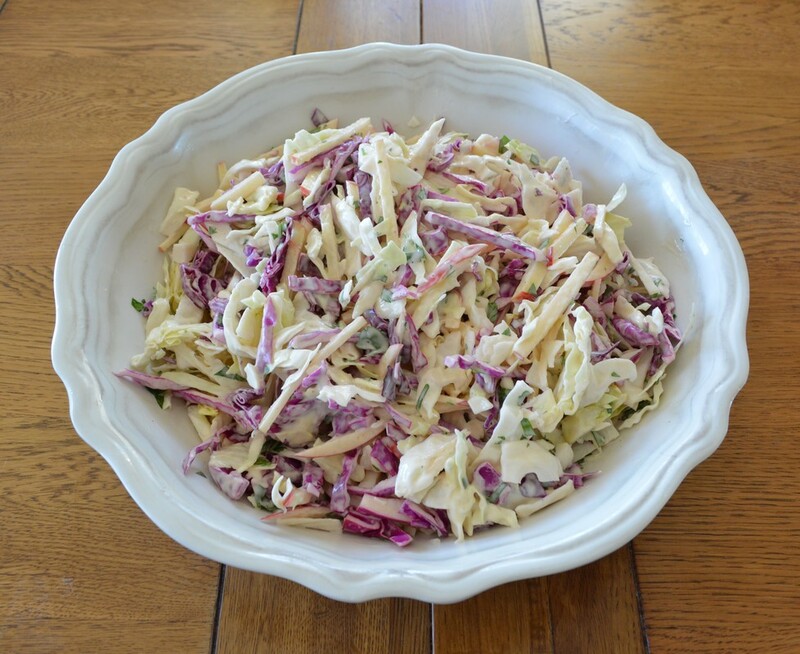 Use just white cabbage or a combination of white and purple. Leave the peel on the apple. You can add shallots or sliced red onion, if you like. I like Thomy mayonnaise, but use whatever brand you like. Simple, fresh, tasty and goes with so many things. Combine mayonnaise and vinegar in a bowl. Add cabbage, parsley and apple, season and mix well.